The Magic Teapot, the festival venue established in 2017, is exhibiting at this year’s Showman’s Show for the very first time. 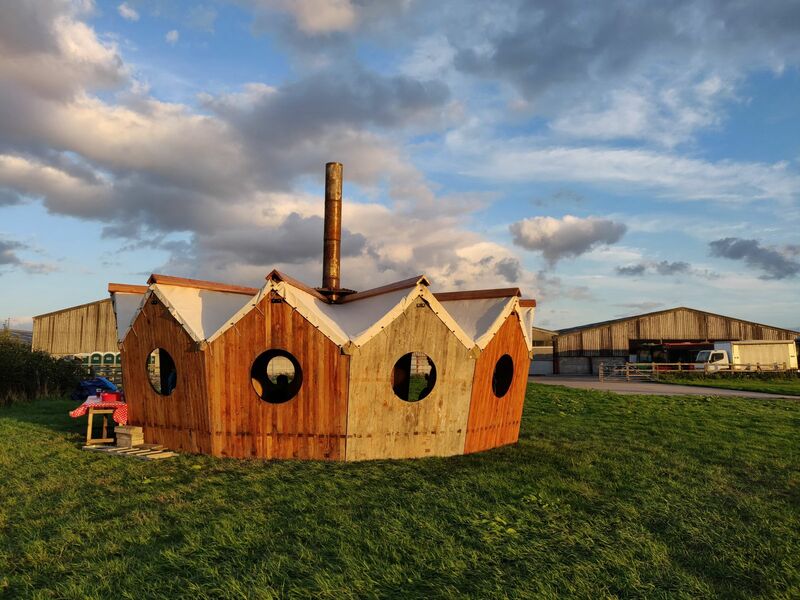 The lovely, unique eight metre, 12 sided structure is an all-weather fireside venue. The fire bowl in the centre raises the fire off the ground and its tall chimney funnels away the smoke. Within the structure there is ample seating all the way round allowing groups of people to hang out together or for the whole place to join in song. The space is hosted by the Teapot Crew who are musicians, tea makers and fire keepers. Entertainment is provided day and night and guests to the space are encouraged to bring what they can to the circle…a song…a story…a listening ear. As the venue is acoustic only, it isn’t subject to the curfews imposed by local authority festival licensing regulations. It can literally go all night long! It always arrives with a piano and a range of other instruments (guitars, fiddles, saxophone etc). It is musically inclusive, and the Teapot Crew encourage anyone to do a turn or join in as we jam. The kettle is always simmering on the fire, making tea and coffee round the clock. There is no set price for tea and coffee, people are just encouraged to put what they think it’s worth into the ‘magic teapot’ which sits atop the piano. It is also about as green as you can get - being acoustic-only means no electricity required; real mugs and cutlery means no single-use plastic waste; it uses sustainably sourced logs to fuel the fire and boil the kettle; the build and break is done by hand, so there are no heavy vehicle requirements; and the whole structure, including the piano, packs onto a single trailer for transport. At every festival it goes to, festival-goers enthuse about how The Magic Teapot is their favourite part of the festival.